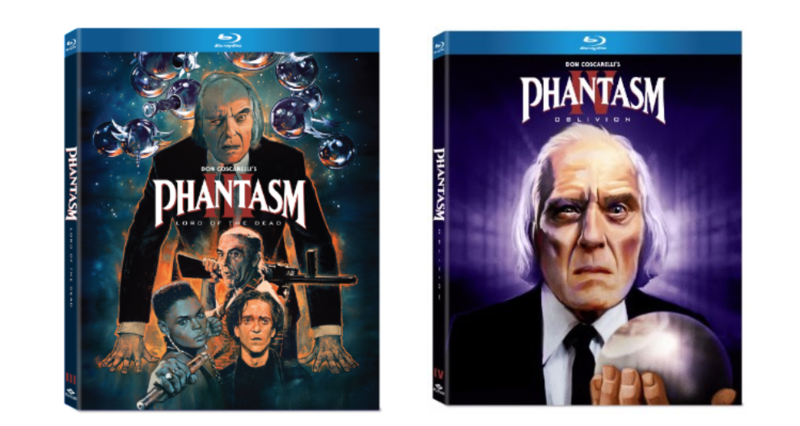 Phantasm III & Phantasm IV Debut On Blu-ray On September 18, 2018! Phantasm III: Lord of the Dead & Phantasm IV: Oblivion Coming To Blu-ray This September! Fans of the Phantasm film franchise can look forward to owning Phantasm III: Lord of the Dead (1994) and Phantasm IV: Oblivion (1998) when both titles make their Blu-ray debut on September 18, 2018, from Well Go USA Entertainment. In horror icon Don Coscarelli’s Phantasm III and IV, Mike (Michael Baldwin) faces off against a lethal arsenal of terrible weapons when he confronts a mysterious grave robber known only as the Tall Man (Angus Scrimm). Along with the two titles debuting on Blu-ray on September 18, 2018, Don Coscarelli’s memoir True Indie: Life and Death in Filmmaking will be published by St. Martin’s Press on October 2. The Tall Man is back with a vengeance! Fifteen years after the original horror classic, writer/director Don Coscarelli reunites brothers Mike (A. Michael Baldwin) and Jody (Bill Thornbury) to help their friend Reggie (Reggie Bannister) destroy The Tall Man (Angus Scrimm) once and for all. Is the ultimate of evil any match for a bald, former ice cream vendor with a ‘70 Hemicuda and a four-barrel shotgun? Gloria Lynne Henry (Phantasm Ravager) and John Chandler (The Outlaw Josey Wales) co-star in this insane sequel packed with violence and gore galore that takes the Phantasm series to a whole new dimension! Phantasm III: Lord of the Dead has a runtime of approximately 90 minutes. It is rated R for violence and gore, and for language and sexuality. The Blu-ray will be available for $29.98 SRP. With a runtime of approximately 90 minutes, Phantasm IV: Oblivion will be available for $29.98 SRP. It has been rated R for horror violence/gore and some strong language. You can go ahead and follow Well Go USA Entertainment on Facebook and Twitter. Make sure to use #PhantasmLordoftheDead and #PhantasmOblivion if you wish to join the conversation. Are you a fan of the Phantasm franchise? Let us know. Next: Free 3×06 Review: Mermaid of the Abyss!